The Mystery of MH370, The Real “Thunderball”?. At this hour the mystery of Malaysia Airlines flight 370’s disappearance is one of the most baffling chapters in aviation history. With every hour that passes the mystery becomes more remarkable. There was no distress signal, automated or manual, no radar track to a known accident site, no anomalistic flight data transmitted, no covert hijacking signal, no wreckage, no diversion to a remote airfield under duress, no witnesses of an actual crash in one of the world’s busiest shipping lanes. That the aircraft likely vanished over one of the busiest commercial shipping areas in the world, the Straits of Malacca, with 50,000 to 90,000 ships a year passing through it’s narrow, 500-mile passage is even more remarkable. When you perform a statistical analysis of aircraft accidents over the previous 30 years that involve more than 100 passengers you see how truly bizarre this mystery is. The U.S. Federal Aviation Administration maintains a detailed database of aviation accidents broken into 18 accident causation categories. They include “Crew Resource Management”, “Fuel Ignition”, “Fuel Exhaustion”, “Incorrect Piloting Techniques” and others. All of them leave some trace to conduct a forensic investigation. That MH370 left no trace, electronic or otherwise, is its most remarkable anomaly. Given the volume and sophistication of systems to avoid just such a disappearance one explanation is some willful intervention to counter each of these surveillance and tracking systems took place. Someone intentionally lost the aircraft. One unnamed source has already proffered an opinion on this disappearance: MH370 was hijacked in a 9/11 style terrorist attack. The target may have been the Petronas Towers in Kuala Lumpur, a hauntingly similar target to New York’s Twin Towers. The attack failed when some intervention, perhaps by crew, passengers or other force led to the flight’s termination in a similar way to United Airlines flight 93 that crashed in Shanksville, Pennsylvania when passengers attempted to intervene in the hijacking and retake the aircraft before reaching its intended target. 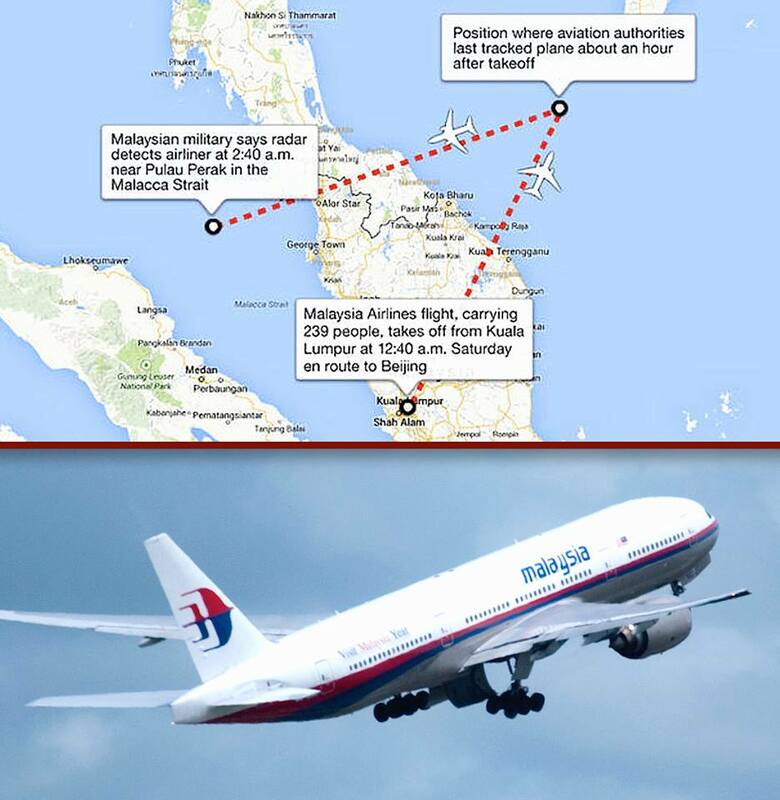 It is possible the flight disappeared when it descended to low altitude for the willful purpose of evading radar as it turned back toward Kuala Lumpur on its attack run. This admittedly outlandish theory is partially supported by Fisherman Azid Ibrahim, 66 of Kota Baru, Indonesia. Ibrahim told the New Strait Times that an airplane appeared to fly low below thick cloud deck. He followed the aircraft for about five minutes before it disappeared without crashing. Another witness reported a similar sighting about 30 km (18.6 miles) away from Kota Baru. Businessman Alif Fathi Abdul Hadi, 29, reported to the Malaysian Maritime Enforcement Agency (MMEA) that he saw “bright white lights”, descending fast into the sea at about 1:45am that same day. A third report from an oil rig also reported seeing a large aircraft flying at low altitude over the region, then a burning object. In December 2011 the Co- pilot on MH370, Fariq Abdul Hamid, broke regulations when he allowed female passengers Jonti Roos and Jaan Maree into the cockpit, while flying, for a flight from Phuket, Thailand to Kuala Lumpur, Malaysia. The 53-year old captain of MH370, Zaharie Ahmad Shah, had a room in his house dedicated to a computer flight simulator where he could practice flying a Boeing 777. And familiarize others with how to do it. In an interesting literary parallel, Ian Fleming’s 1961 novel and 1965 film “Thunderball” depicts a fictional RAF pilot named François Derval who is extorted by sexual coercion into stealing an aircraft for a terrorist plot. This is speculation. But it has origins extrapolated from known statistical data of airline accidents along with an analysis of the region, its vulnerabilities, its known terrorist activity and additional factors. It also is partially reinforced by the emerging navigation tracks of MH370 that show it returning toward Kuala Lumpur where it originated and where the Petronas Towers are. It is also as implausible a theory as the 9/11 terror attacks were on 9/10. Before the 9/11 attacks and former President Bush’s election the Clinton administration had intelligence that suggested a coordinated attack using airliners in the Pacific region was a plausible threat. One analysis suggested the attacks might originate from Indonesia. The theories were not regarded as actionable. By 9/12 this paradigm had shifted. When will know the facts about MH370’s disappearance? That is another mystery. Until then all we have is questions and speculation as passing time creates more depth to one of the most bizarre mysteries in aviation history.